5.4 Earthquake hits southern Taiwan. 5.0 Earthquake hits the southern Indian Ocean. Experts in Indonesia are preparing to build a huge wall to stop the ocean from swamping parts of Jakarta. Some suburbs in the capital already go underwater when there is a big tide but the problem is expected to get even worse. Jakarta is sinking by up to 10 centimetres a year and Indonesia’s national disaster centre says with oceans rising, large parts of the city, including the airport, will be inundated by 2030. Flooding and high tides are already causing problems for some residents in the city of 10 million people. Bodies of five victims have been discovered. At least 20 people are still expected to be buried under the debris. Seven people were injured and a number of vehicles buried in mud. Landslide occurred road between the cities of Neiva and San Vicente del Caguán to the south-west of the capital of Colombia. Tropical Cyclone Freda located approximately 465 nm northwest of Noumea, New Caledonia. Snow emergency declared in parts of Massachusetts, Boston. A Winter Storm Warning has been issued for most of eastern Massachusetts. One person reported to be killed in rainstorm in Vathylakos of Karditsa in central Greece. Due to overflow of Sperchios river, over 4 million square meters have flooded near Lamia, in central Greece. Around 200 roma people are living in evacuation center. A river has also overflown at Kalamos, north of Athens. A state of calamity has been declared in 11 towns of Capiz, in the Philippines that suffered from flooding due to Typhoon Quinta. Calamity declared towns are Panay, Pontevedra, Panitan, Maayon, Sigma, Mambusao, Dumarao, Dumalag, Tapaz, Cuartero and Dao. 5.8 Earthquake hits Hindu Kush, Afghanistan. 5.4 and 5.2 Earthquakes hit near the east coast of Honshu, Japan. 5.2 Earthquake hits offshore Chiapas, Mexico. 5.2 Earthquake hits the Scotia Sea, near Antarctica. 5.1 Earthquake hits the northern Molucca Sea. 4.9 Earthquake hits the Talaud Islands, Indonesia. 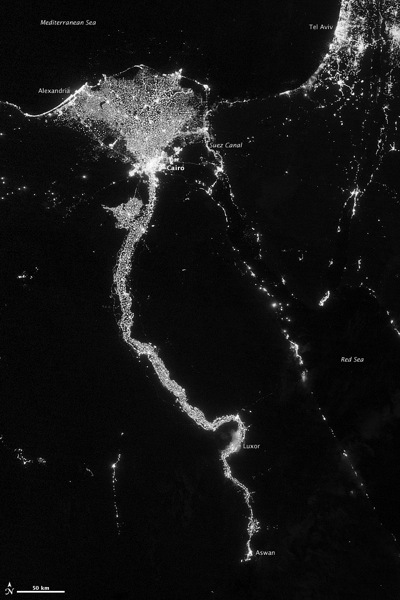 This satellite image of the River Nile in Egypt taken at night shows the extent of human settlement along the life-giving river, with very little settlement away from the water, with further strong areas of brightness around Cairo, along the Suez Canal and Tel Aviv. Pacaya volcano in Guatemala is waking up. A series of 3 small explosions occurred yesterday morning and generated small ash plumes rising 500 m. The explosions were probably phreatic, but along with the previous explosions 10 days ago they likely indicate that magma has started to rise within the volcano and might reach the surface soon again. Strombolian and/or lava flow effusion activity, Pacaya’s typical activity, could thus resume in a relatively short time. Activity at Fuego volcano has remained essentially unchanged with weak strombolian explosions (11 counted during 28-29 Dec) producing small ash plumes up to about 500 m high, and the continuing lava flow, about 500 m long on the upper southern slope. The Santiaguito lava dome has been comparably calm with few or no explosive activity reported during the past days. The number of small explosions and steam-ash emissions from Popocatépetl volcano in Mexico remains at moderate levels (1-2 per hour). Glow from the crater indicates that the slow magma supply to the crater continues. Activity at at San Cristobal volcano in Nicaragua has calmed down, at least for now. Only few and weak new ash emissions occurred since the afternoon of 28 Dec, and current seismic activity is low. At nearby Concepcion volcano, an increase in small volcanic quakes can be seen on recent seismograms. Arenal volcano in Costa Rica showed some elevated internal activity on 29 Dec, but has been calm again today. Mild ash explosions continues to occur sporadically at Galeras volcano in Colombia, such as recently seen on 29 Dec.
An SO2 plume drifting from Nevado del Ruiz volcano shows ongoing intense degassing. INGEOMINAS reported occasional steam and ash venting. Small earthquakes and occasional low-level volcanic tremor pulses can be seen on the seismic recordings. Seismic unrest with small deep (12-15 km) quakes continues at Cerro Machin volcano. In Ecuador, activity at Tungurahua volcano has picked up again. During 29 Dec, 30 explosions over 24 hours of small to moderate size, sometimes accompanied by loud sounds and ejection of incandescent material. Ash plumes were reported reaching 25,000 ft (7.5 km) altitude. Numerous volcanic quakes and tremor pulses accompanied constant gas and ash emissions. At Reventador volcano, sporadic small explosions and ash emissions continue, but at lower levels than during past months. Visual and seismic activity have decreased at Copahue volcano in Chile. No more ash emissions or incandescence have been observed since 29 Dec. It is thought that the small eruption that had started on 22 Dec has ended. The small body of lava (a lava dome) that was emplaced inside the crater is now cooling. SERNAGEOMIN has lowered the alert level to yellow. The lava flows from the southern fissure of Plosky Tolbachik volcano in Kamchatka continue to be alimented and KVERT reports that tremor is still strong (although much less than 1-2 weeks ago). The plume and visible glow from the eruption are smaller as well but still present. MODIS satellite data continue to show a hot spot at Australia’s Heard Island volcano. This indicates that some activity is probably present at this volcano. Wildfire burns more than 2 000 Ha near Hermanus, Western Cape, South Africa. Tropical Cyclone Freda brought heavy rainfall to the Solomon Islands and is currently churning over the open Coral Sea. 5.5 and 5.0 Earthquakes hit the Bismarck Sea. 5.5 Earthquake hits Sulawesi, Indonesia. 5.5 Earthquake hits Komandorskiye Ostrove, Russia. As the number of people hospitalized by an outbreak of legionnaires’ disease in southwest Calgary has risen to eight, public health officials remain puzzled over the source of the potentially deadly infection. A passenger airliner ran off the runway at Moscow’s Vnukovo Airport on Saturday, breaking apart and catching fire. 12 people were aboard the Tu-204 (a twin-engine medium-range jet with a capacity of 210 passengers) and all were rescued but two were in serious condition. Details on the crash were not immediately clear. Initial reports said the plane crashed while attempting to land, but later reports said it had crashed while taking off. Light snow was falling in Moscow at the time. Pictures indicated that the plane’s nose, including the cockpit area, appeared sheared off. -TC Mitchell was located 330 nm northwest of Learmonth, Australia. -Heavy rainfall and coastal flooding is expected in the Pilbara region. -TC Freda was located 690 nm northwest of Noumea, New Caledonia. -Cyclone Freda caused flooding in Solomon Islands. Makira is reported to be hardest hit with rising rivers flooding some areas. -The death toll from Tropical Storm Wukong (local name Quinta) in the central Philippines has risen to 11. Three people are still missing. -Flood displaced more than 28,000 people. -A state of disaster has been declared in nine towns in Iloilo and Aklan provinces. -At least 10 people among them three children are reported to be killed in landslides in Elgeyo Marakwet County of Kenya. 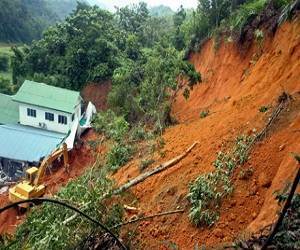 -Heavy rainfall caused mudslides in the area. Rescue efforts are still continuing despite ongoing rain in the affected areas. -Nearly 400,000 Sri lankans are still affected by floods, 40 are confirmed dead and 7 are still missing in Southern, Central, North Central, Uva, Sabaragamuwa, Eastern, Northern and North Western Provinces. Two 5.1 Earthquakes hit the Kermedec Islands off New Zealand. 4.9 Earthquake hits the Samoa Islands. Lokon volcano in North Sulawesi has had another explosion yesterday (27th) at 16:50 local time. The ash plume appears to be of considerable height, although Darwin VAAC has not (yet) published a warning. The eruption of Tungurahua volcano in Ecuador continues at fluctuating, but generally reduced intensity compared to the previous week, but there are still occasional weak to moderate explosions and near constant steam and ash emissions that produce a column rising up to about 2 km above the crater. The current seismic signal shows a moderately strong tremor present. Ash emissions continue at Nicaragua’s San Cristobal volcano. So far, the size of explosions has been small with ash columns of 500-800 m and only light ash fall has occurred in areas mainly to the west and southwest. However, evacuations of people within a 3 km radius around the volcano have started as a precaution. About 1500 farmers living on the slopes of the San Cristobal volcano have refused to leave, despite being ordered to evacuate. The number of emissions from Popocatépetl volcano in Mexico has dropped again to only about 1-2 per hour, but the type activity, small puffs of steam, gas and sometimes ash, remains essentially unchanged. Copahue volcano in Chile produced new ash emissions on 27 Dec. Ash clouds at 10,000 ft (3 km) altitude extending about 50 km NE along with strong SO2 emissions were visible on satellite data. Another small earthquake swarm (smaller than the one end of Oct) has started last night at Mammoth Mountain west in California, west of the Long Valley caldera. Many small quakes have been occurring in an area5 km SW of the mountain at depths around 20 km. -Four killed in worst flooding in 30 years in Baghdad. -Several hospitals in the city including Fatima al-Zahra hospital in Sadr City was also flooded. -Government has declared national holiday today. -Following Iraqi Meteorological Organization, about 6.75 centimeters (2.56 inches) of rain fell in Baghdad on Wednesday. -Floods triggered by torrential rains in Malaysia killed two people. -More than 20,000 people are currently living in evacuation centers. 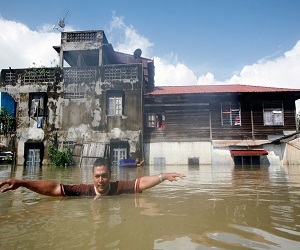 -Recent flood in Malaysia is expected to be worst since 1971! -Floods have affected Terengganu, Kelantan and Pahang area of Malaysia. -More rain on the Malaysian east coast is forecast over the coming days. -Huge storm caused heavy rainfall and flooding in Asheville area of North Carolina. -Thousands of residents in Buncombe County and Henderson County are still without power. -Several roads across the area are also closed because of snow and ice. -Death toll from several tornadoes from Texas to Alabama has risen to six. -More than 243,000 homes and businesses are still without power. -Another blizzard warning is issued from northeastern Arkansas to Cleveland, Ohio, where almost 14 inches of snow is expected to fall by Thursday. -A powerful winter storm responsible for wind, snow, tornadoes and a flurry of traffic accidents battered the U.S. Northeast on Thursday, canceling hundreds of airline flights but also reviving what had been a snowless ski season. -The storm dumped a foot (30 cm) of snow on parts of the United States with the heaviest snow falling across northern New York and into New England, the National Weather Service reported. -The National Weather Service issued winter storm warnings for parts of Pennsylvania, New Jersey, New York and New England and coastal flood advisories from New York’s Long Island to southern Maine. -Airlines canceled nearly 700 flights on Thursday after 1,500 U.S. flights were canceled on Wednesday.